Colonial America generally describes the period of American history between the Pilgrims' arrival in the New World and the victory of the colonists over England in the American Revolution (1607–1776). The contents of this website break down this time period into five categories in order to better examine and understand these historical events in relation to one another and to America today. Colonial America is a fascinating chronicle full of both adventures and mistakes that interwove difficult but necessary life lessons into the American experience. 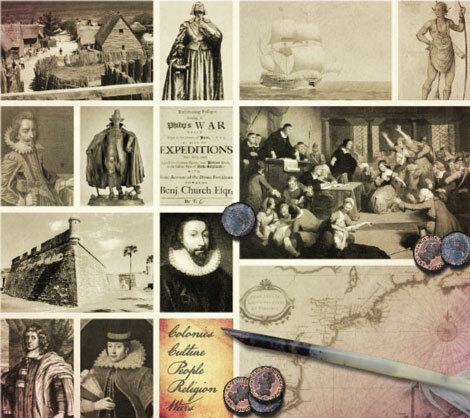 At its foundation, it is the story of immigrants who gathered at the far side of the Atlantic and risked their lives for religious freedom and a belief in a new society. Every effort has been made to ensure the historical accuracy of the contents of "Colonial America." Please refer to the bibliography links to view the sources used for each page. All images that appear on these pages are used with the permission of the copyright holder. We've tried to track down the sources of all our images and to cite them as accurately as possible. However, if you notice an image that has been cited incorrectly in this list, please contact Small Planet and tell us about it so we can make the correction.